Ask any number of people whether Tilting at Windmills is a pattern or not and you may be surprised by the answers. 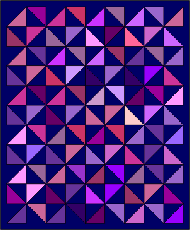 Some will have no doubt that it is a pattern because the navy triangles make a constant repeating design and the other colours are irrelevant. Others will be equally adamant that is not a pattern. 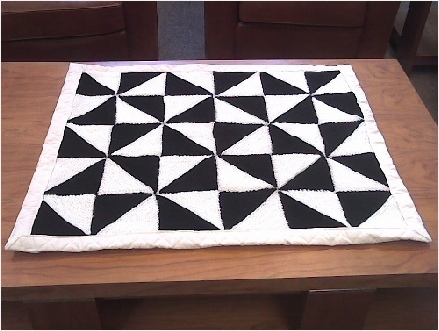 Squares are knitted individually and stitched together. 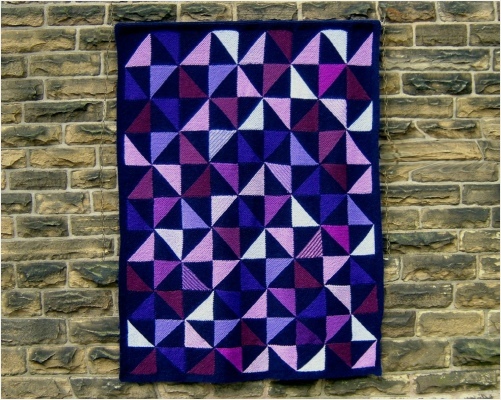 The squares can be made by more than one person and are guaranteed to fit together. Use any yarn and needles of your choice. Use the same thickness of yarn throughout but you can use up oddments of any colours.  One half of each square is in the same dark colour. The other side of each square can be in any colour. 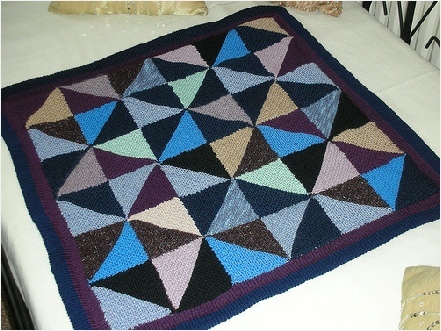 The overall size of the afghan can be adjusted by using a different number of squares. You could also change the size of the squares. It is very surprising that this came so late in our development. It is a return to the very simplest ideas we had years before. 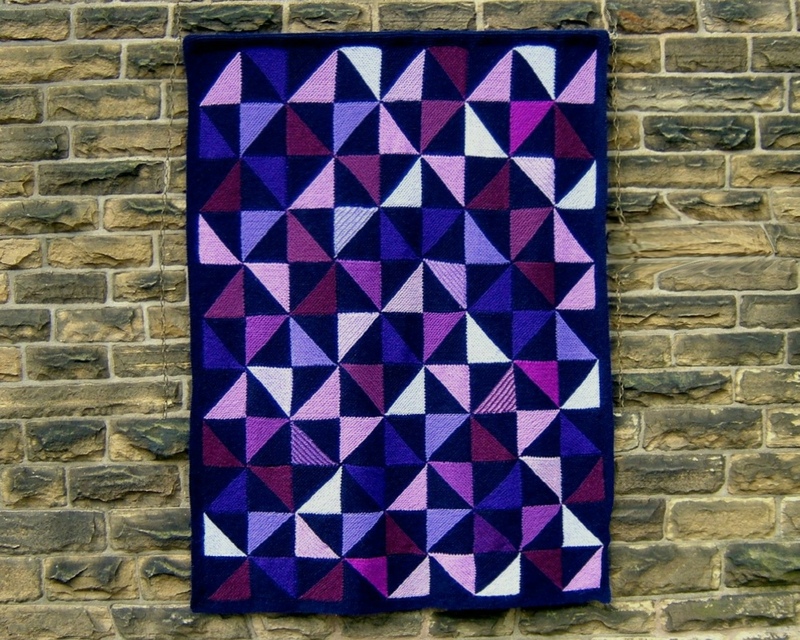 We had made several garments and drawn dozens of designs with similar squares but in the past they had mostly been in two colours with the squares arranged in various ways to produce strikingly different designs. It was made deliberately to provoke thoughts about what a pattern really is. This has been the most used of all our afghans. It has been used with children in school, for teacher training, with craft groups and in many other situations. Wherever we go we always begin with the question, ‘Is this a pattern?’. It doesn’t matter who the participants are, we never need to say more as arguments begin without our involvement. Everyone expects everyone else to be seeing what they see but soon realise that this is not the case.  Many see only squares standing on their points, others see squares or triangles in a variety of sizes. Further discussion draws out many ideas, other shapes that can be seen, and what they think a pattern should be. All of this serves to prove the point that we all look at the world differently, according to previous experience and expectations and, for teachers and parents in particular, we should not expect everyone to see the world, or solve a problem in the way we do. 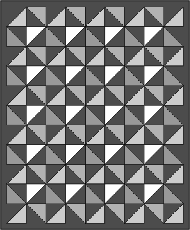 Most people would accept that the grey version is a pattern. 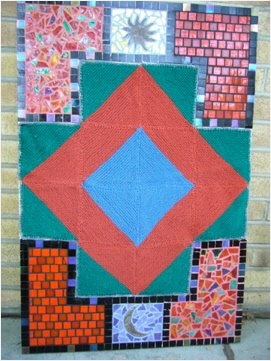 Katrina was inspired by Tilting at Windmills to create this combination of knitting, stained glass and mosaic tiles.